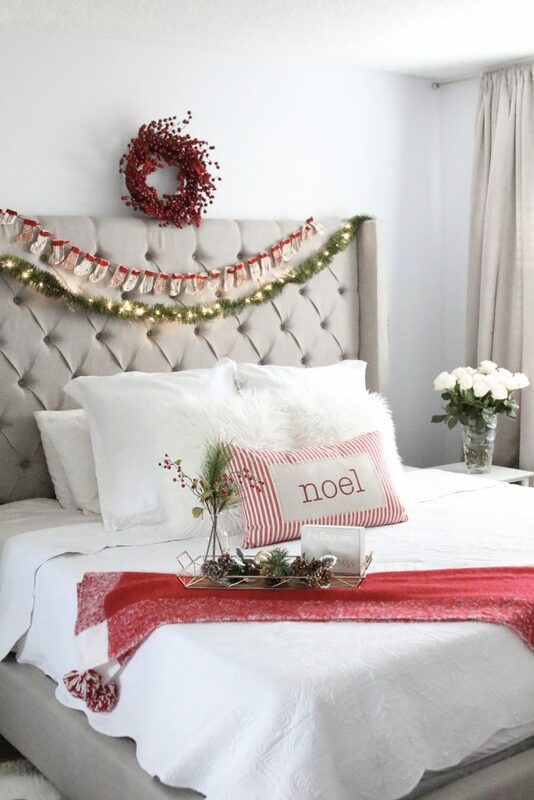 I know I am beyond super late posting this bedroom decor that I did during Christmas time, but I did want to get this post up because I love how it turned out. 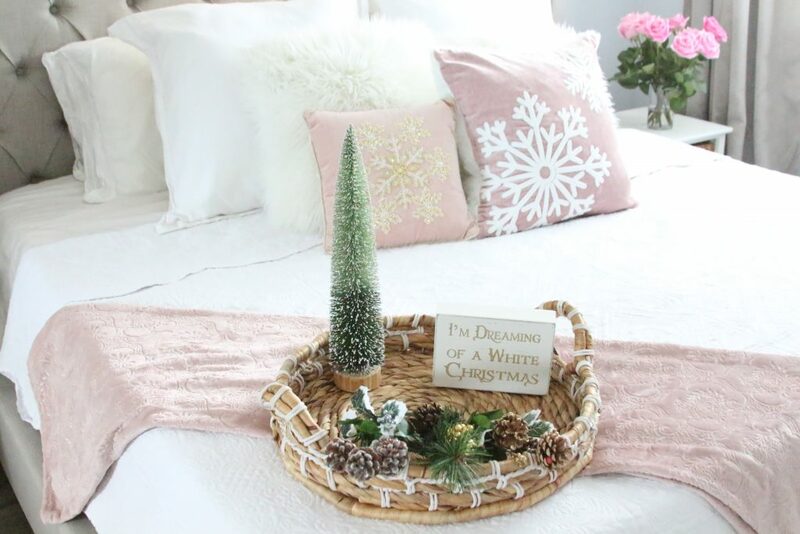 Also, they say the best time to purchase holiday decor is after the holidays, so maybe this is the perfect timing for this post (LOL). It’s never too early to decorate for Christmas in my opinion. 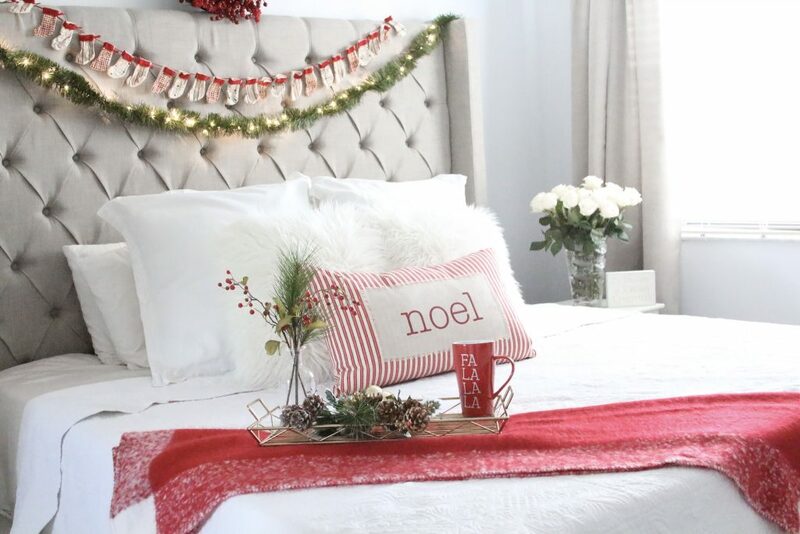 I started my Christmas decorating a couple of weeks ago and decided to test out blush for my bedroom, but with a Christmas twist! I absolutely love how it turned out and I think it is super dreamy and romantic! 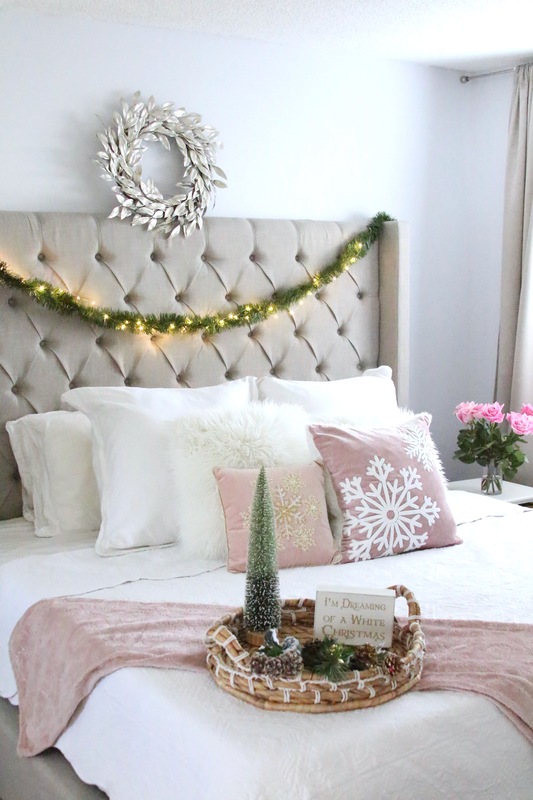 Click here to see more of my blush holiday bedroom decor! I am not sure if I have mentioned or not, but over the past couple of months, I have been making some changes to our apartment. When we moved in over three years ago, most of the items we bought were all from Craigslist and mostly IKEA brand. Fast forward three years, we needed a little face lift. 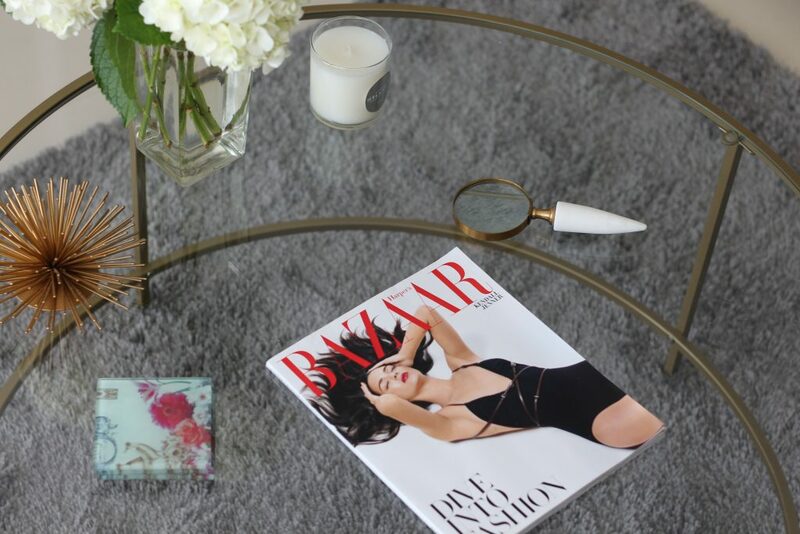 So we replaced one of our awful couches with a new sectional, got a bar cart, which you can read my post about where I purchased it and how I decorate it here, and a few other fun things, like this gorgeous gold coffee table! I found this beauty on Amazon and knew it needed to be mine upon laying eyes on it. I love the gold detailing, but also love glass tables in general because I feel like it makes a space look larger. 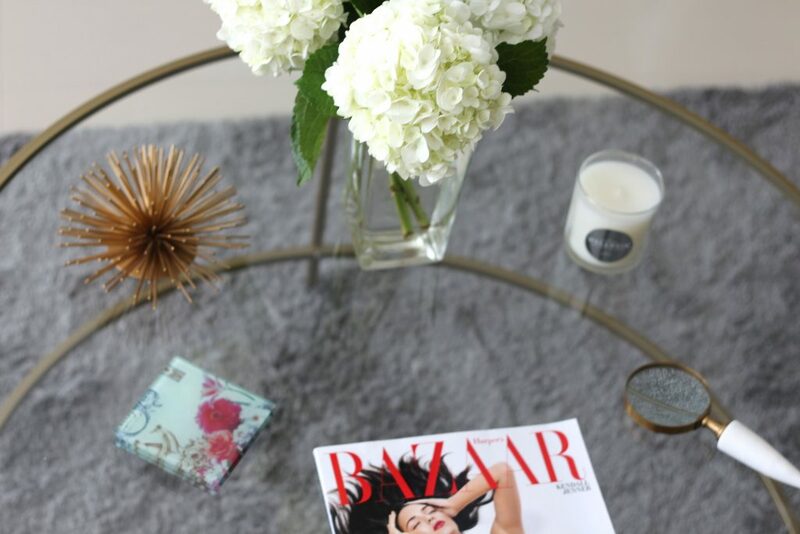 I have been playing around with styling my new coffee table and I think I have found the way I like it best. 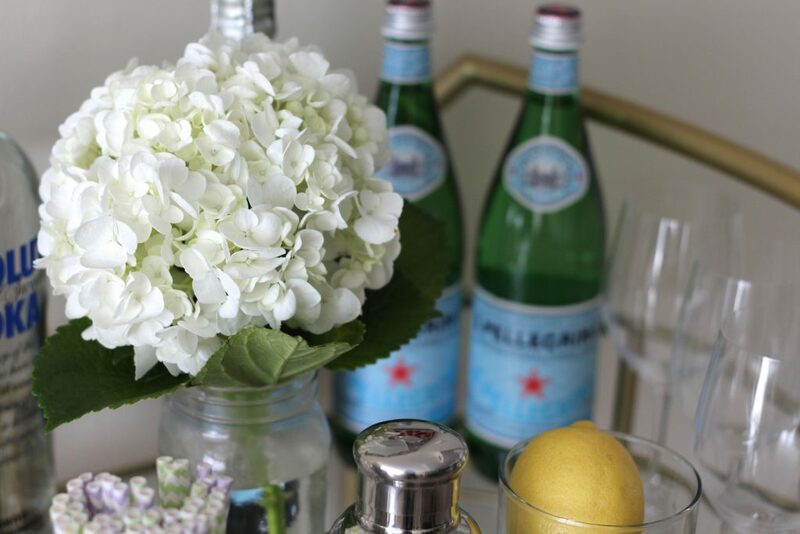 I always try to buy fresh flowers (particularly white ones) and keep a large vase on the top center of the table. That is my starting point. Next, I place my favorite gold spike decor item from Target next to some coaster I purchased a long time ago. I love coasters as decor, but they really do serve a good purpose. Having people put their cups on a glass table can leave residue marks, so coasters are great to have on any time. Next, I placed my fun microscope that I scored at Anthropologie during a sale! Finally, I will either place the latest issue of a fashion magazine or a stack of my fashion books on the table. How do you decorate your coffee table? I would love to hear! I hope you all have a great week. If you aren’t already, be sure to follow along with me on Instagram and SnapChat @BisousBrittany! 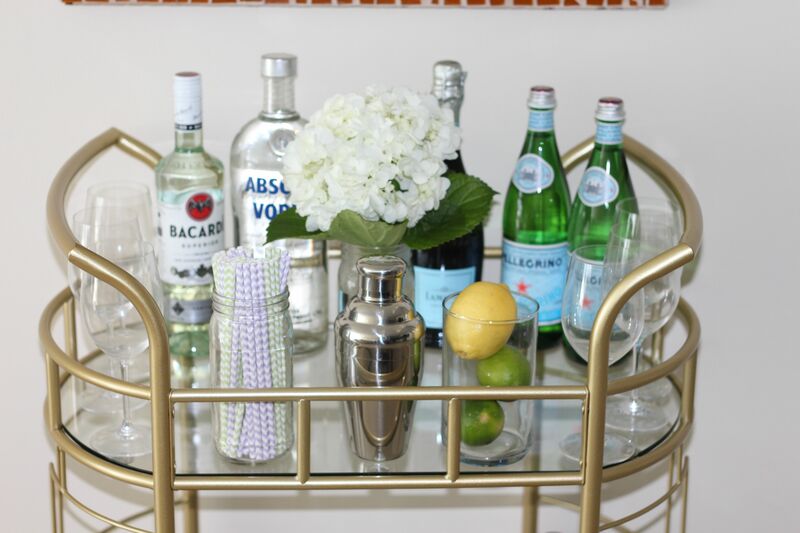 I cannot tell you for how long I have been dreaming about having a bar cart in our apartment. Now, for those who know Tyronne and I, this may be a weird thing to want since neither of us are drinkers. 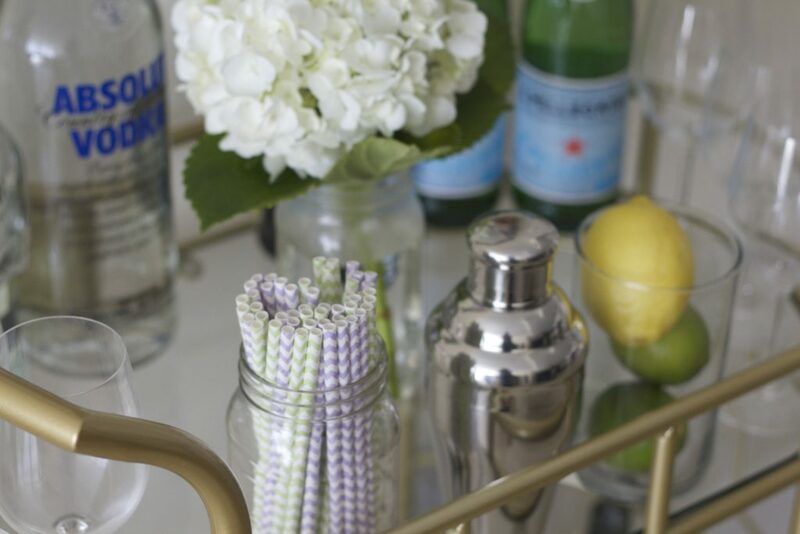 But I just love the look of a great bar cart. And the wonderful thing about bar carts are that you don’t even have to house alcohol in them. 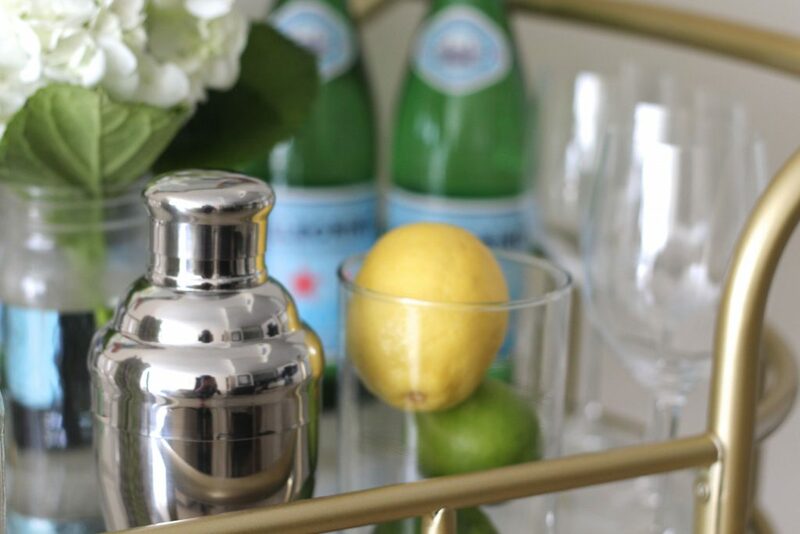 Nowadays, you see so many other things put in bar carts like candles, coffee table books, straws, Pellegrino, flowers and so much more. Believe me, I know… I have a whole Pinterest board here dedicated to bar cart inspiration! 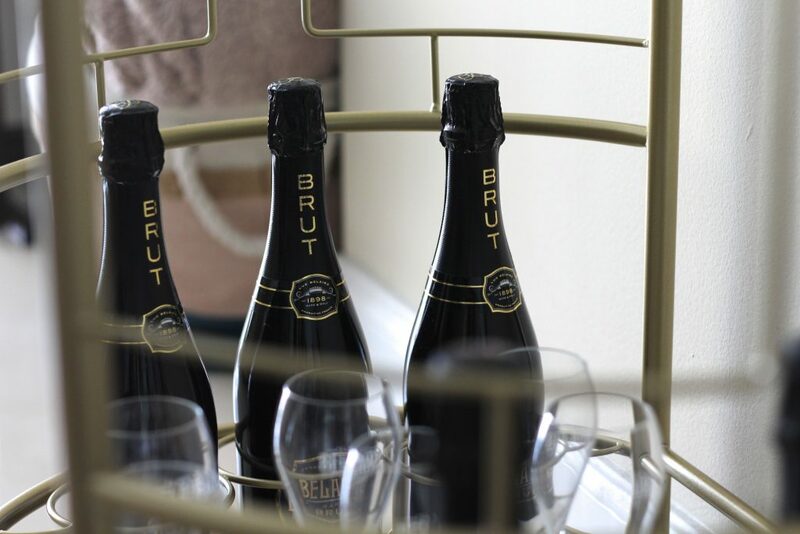 I spent quite some time looking online to find the perfect bar cart. I had been eyeing this one particular gold on from Target for about 6 month (no lie). When I was ready to pull the trigger and purchase it, it was sold out online! I was devastated. I had waited too long to purchase it, and after calling Target’s customer service and them telling me it was no longer being sold, I had to move forward. I continued to browse online and found the perfect one on Amazon. 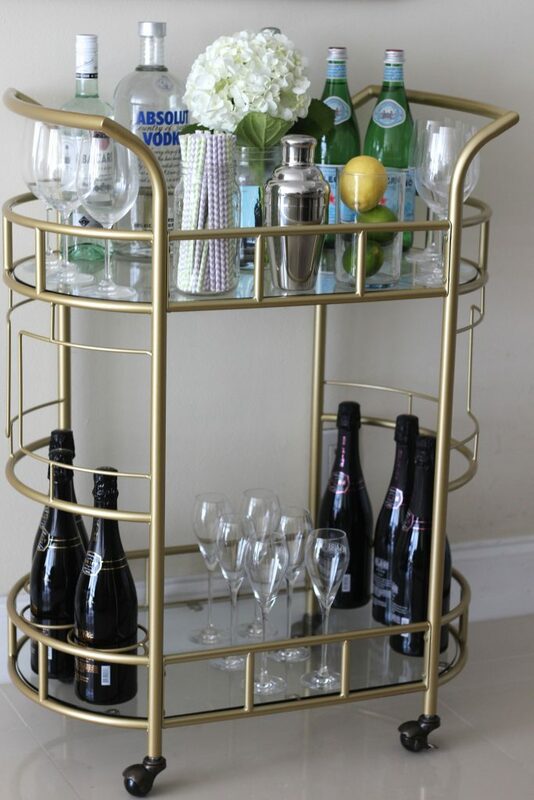 I purchased this Sinclair 2-tier Serving Cart, and when it arrived, I fell in love with it. Funny enough, the day that this bar cart arrived at my house, I received a notification that the Target one had been restocked. I was shocked! I decided against returning the Amazon one and not purchasing the Target one. I felt like it wasn’t meant to be. 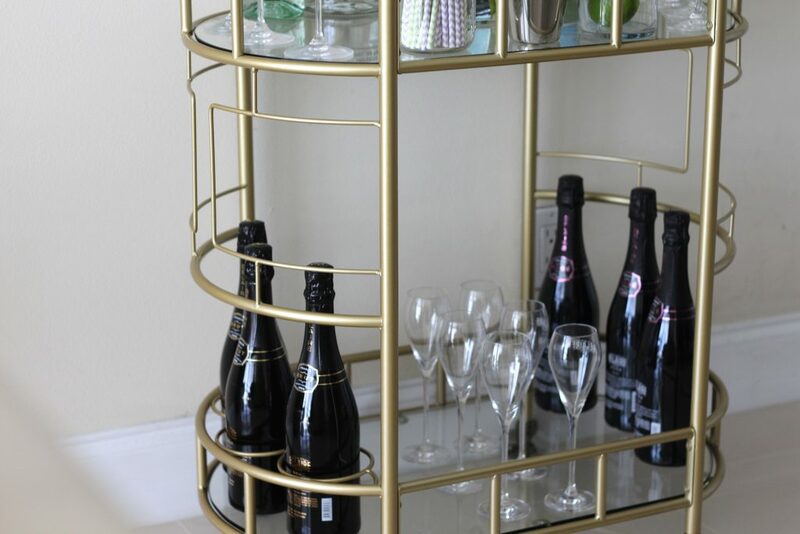 And after all of that bar cart drama, I actually loved this Sinclair one way more! 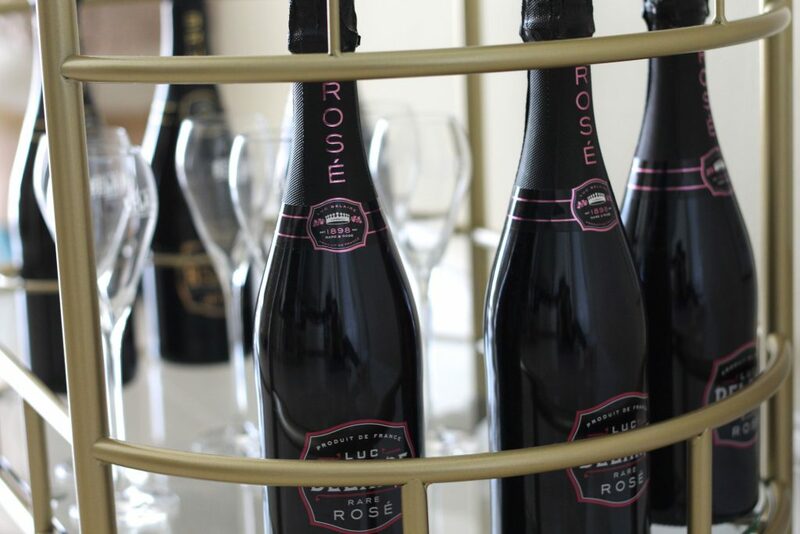 For our bar cart, I house our Luc Belaire Rose and Brut at the bottom where the holders are, as well as our Luc Belaire champagne glasses (which are gorgeous). I think they look so elegant and chic placed there. 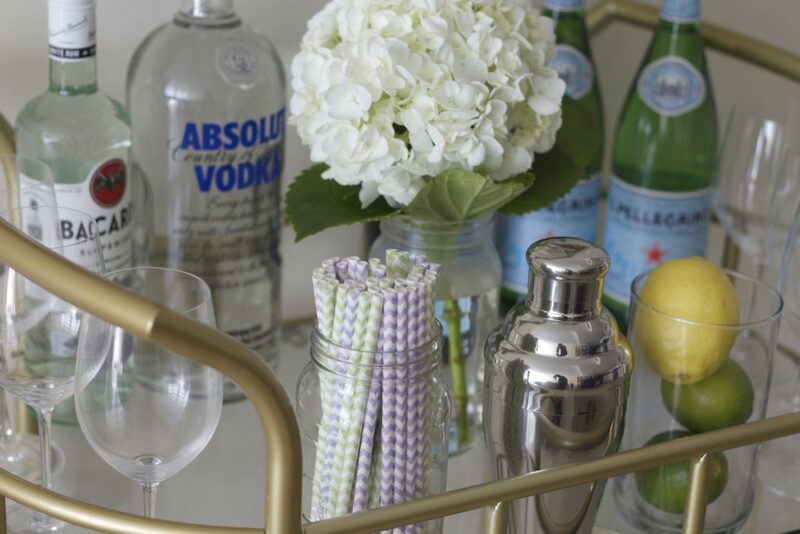 On top, I have one bottle of Absolute Vodka, a bottle of Bacardi rum, two bottles of Pellegrino (which I think is the perfect touch to any bar cart and I would love to have 4 bottles), some decorative straws, a cocktail shaker for making mixed drinks, and some fresh lemons and limes! Oh, and I can’t forget my fresh hydrangea’s. I have been really good about having a fresh vase of flowers in the house. 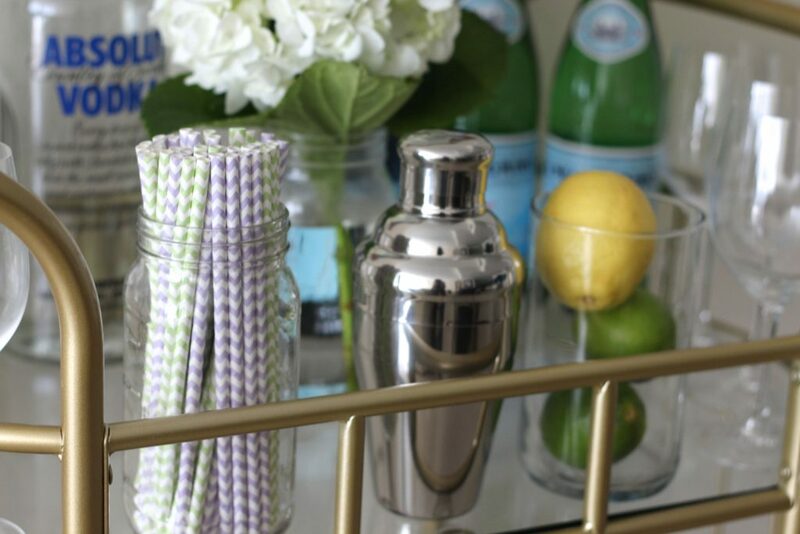 I am so excited to experiment with other decor items and change up my bar cart every so often. 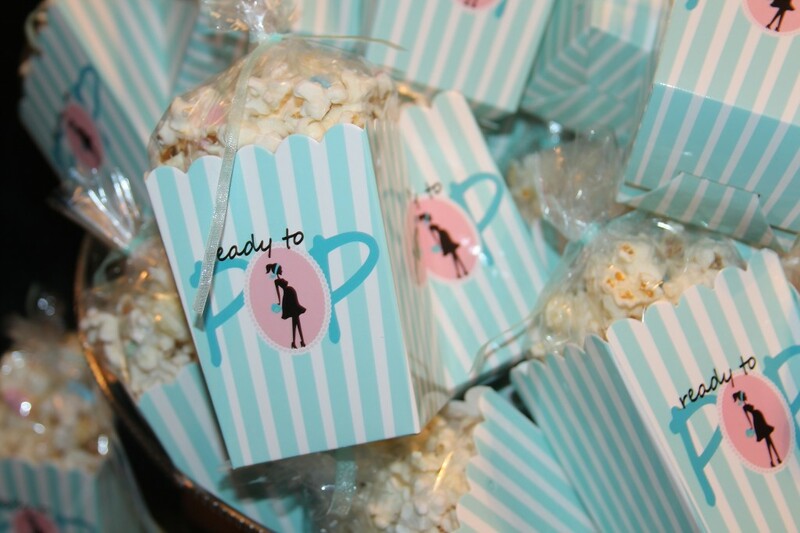 I know that I will be using it not only for entertaining, but I plan on using it for my bridal shower. I am thinking maybe doing cupcakes or donuts on it 🙂 What do you think? 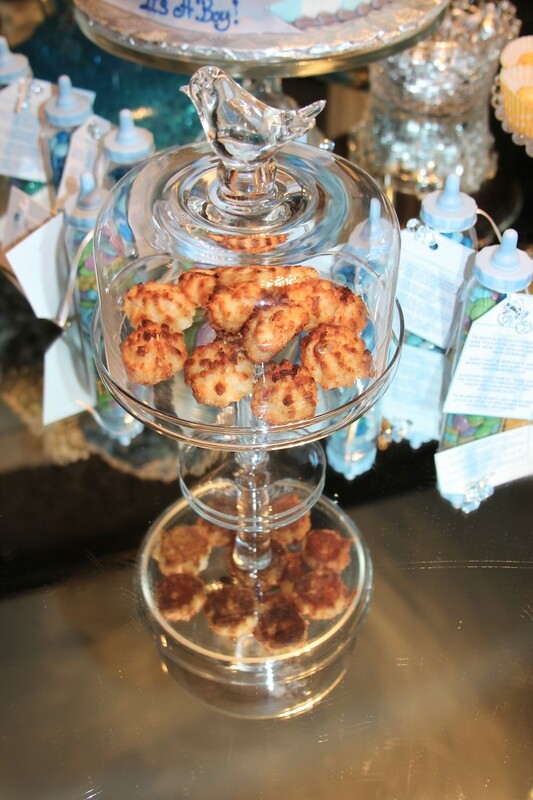 A bar cart of desserts sounds good to me! 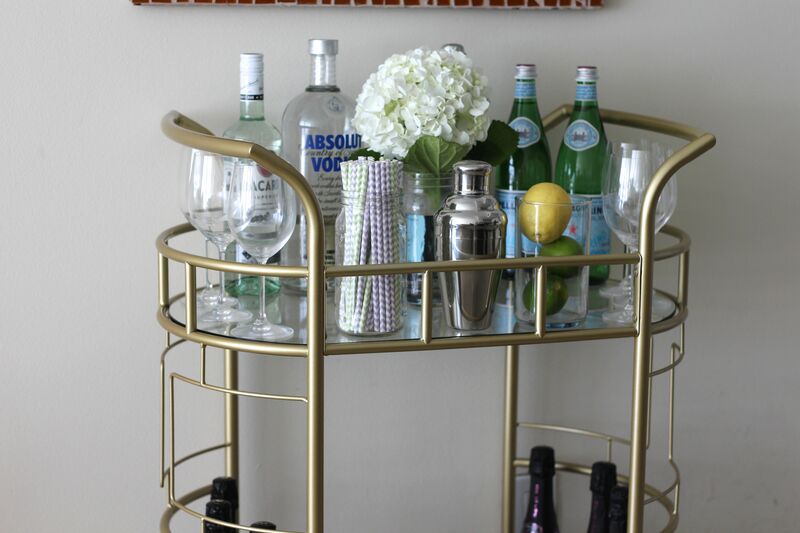 Thanks so much for stopping by and if you have a bar cart, I would love to hear how you style it! Figuring out a way to display my necklaces was always a hassle. I had so many necklaces, and I would forget what I had. I tried to figure out a way that I could display all of my necklaces in a “pretty” way, so that it would double as a necklace holder but also a decor piece. Well, I finally figured it out! My best friend gave to me this framed cork board, and I found in the clearance section of Home Goods these gorgeous large, gold push-pins to hang the necklaces on. When I put it all together, my beautiful creation came to life. 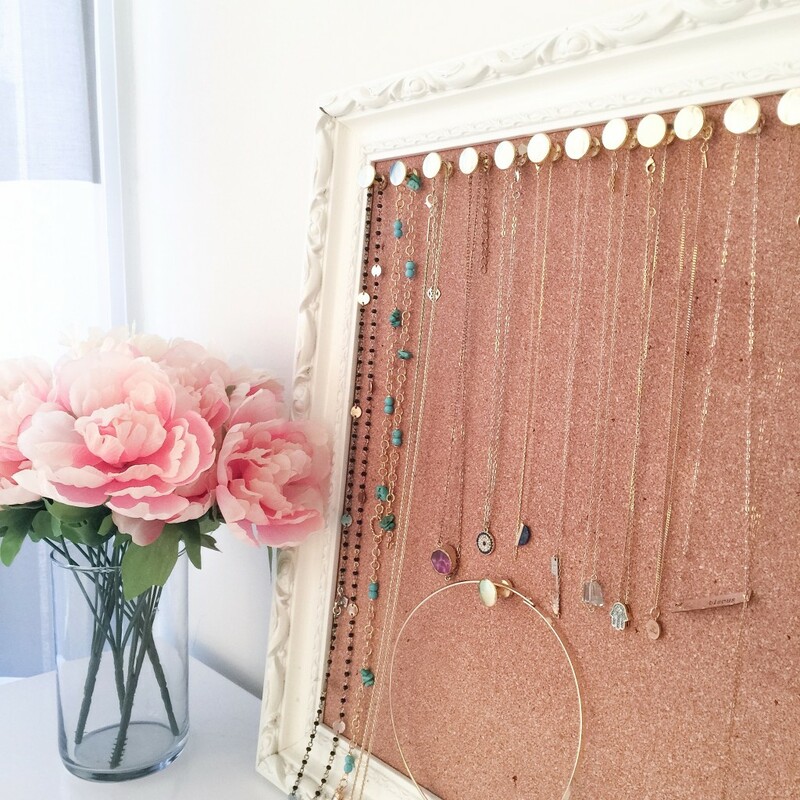 It acts as both a great display for my necklaces so that I can see what I have every day, but also it is a great decor item that i display next to my bedside. I have listed above some similar items for you to create your own organizer! If you try this out, please be sure to share! 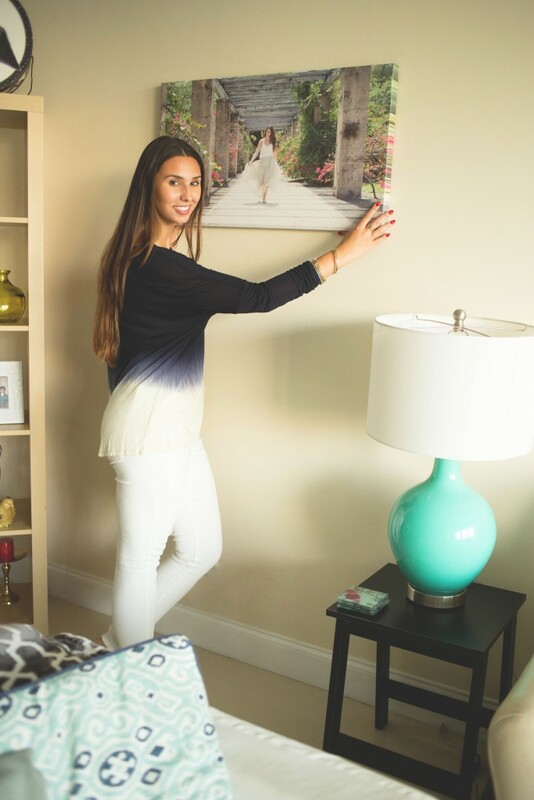 I recently had the pleasure of meeting the two men behind the company CanvasFab, a Miami based canvas company that’s products are 100% handmade. I can attest to their “100% Handmade With Love” motto, because I was given the grand tour of their office and I was quite fascinated. What I love about CanvasFab is how hands on the owners are in the product making. Everything is done with precise detail from the first to last step. 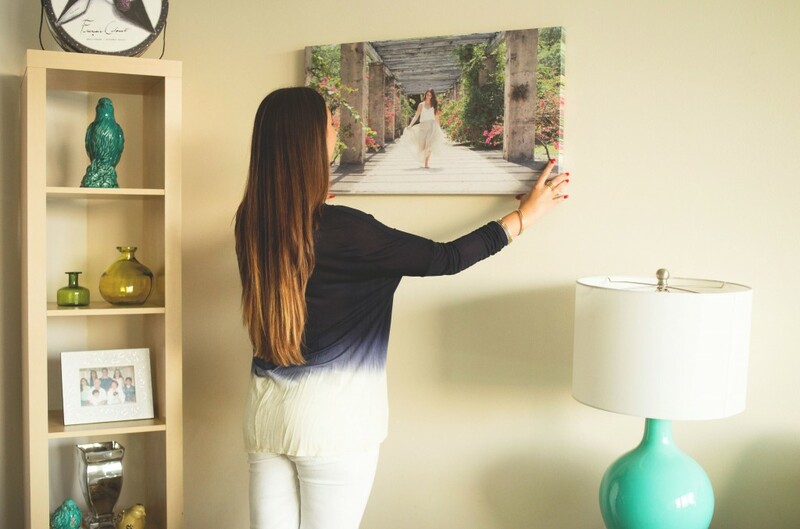 After visiting CanvasFab, it made me realize what a great gift personalized canvas’s would be. 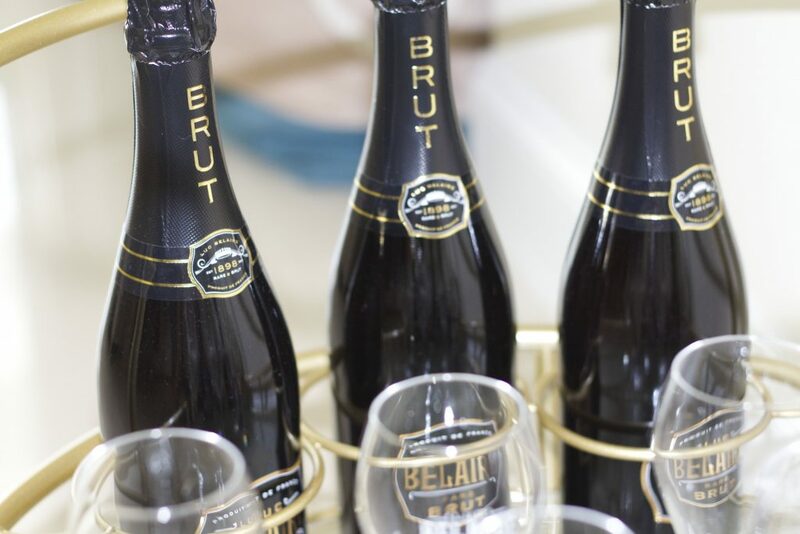 They are perfect for a parents birthday, Mother and Father’s Day, holiday gifts, and even an anniversary gift. Also, their prices are fabulous! 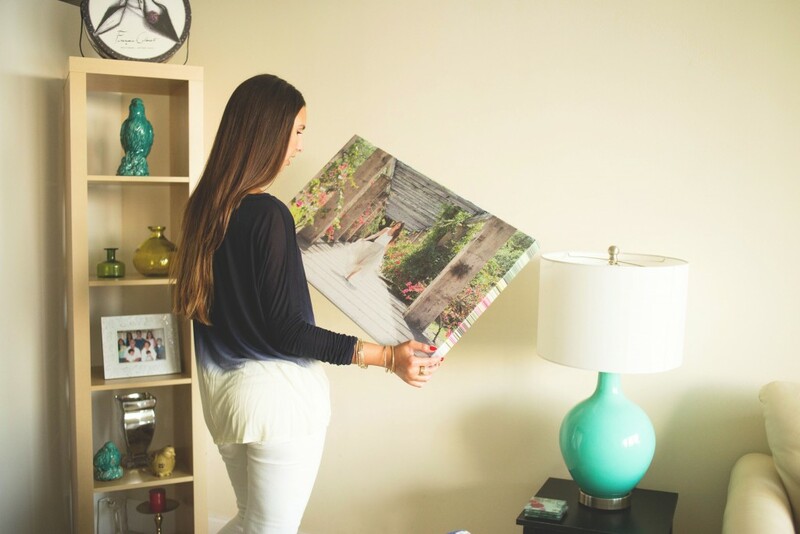 They have a special pricing for any 12×12: they are only $12! If that doesn’t make you want to run out and decorate your house with some of your favorite photos, I don’t know what will. 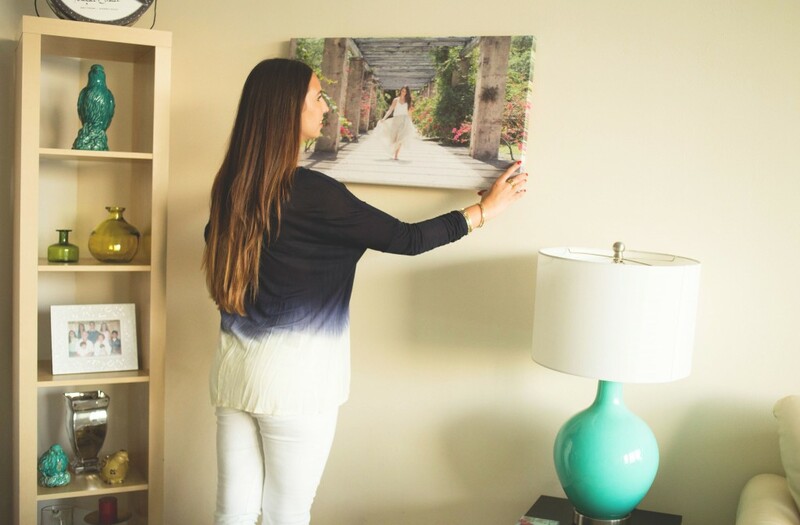 For me, CanvasFab created one of my favorite blog photos into a beautiful statement piece and I couldn’t be happier. 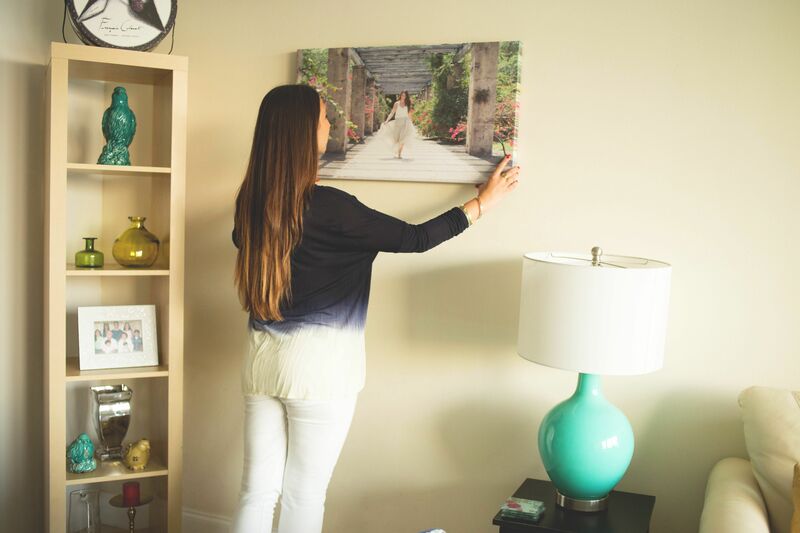 If you want add some beautiful personalized pieces to your home or can’t think of a gift for someone special, check out CanvasFab! I just love the holiday season. From decorating, to dressing up, and baking with loved ones, it is definitely my favorite season of the year. 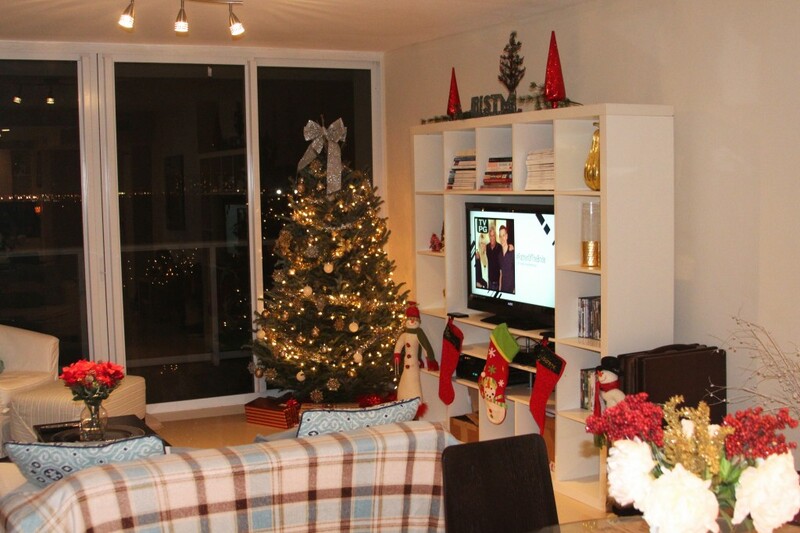 One thing that I love most about the holidays is getting to decorate my apartment. My Christmas Tree fits perfectly in the corner of the room (which I why I leave my tree up for much longer than it needs to be). I love hanging up our stockings that I DIY’d with our names on them, and I absolutely love the smell of baking sweets! 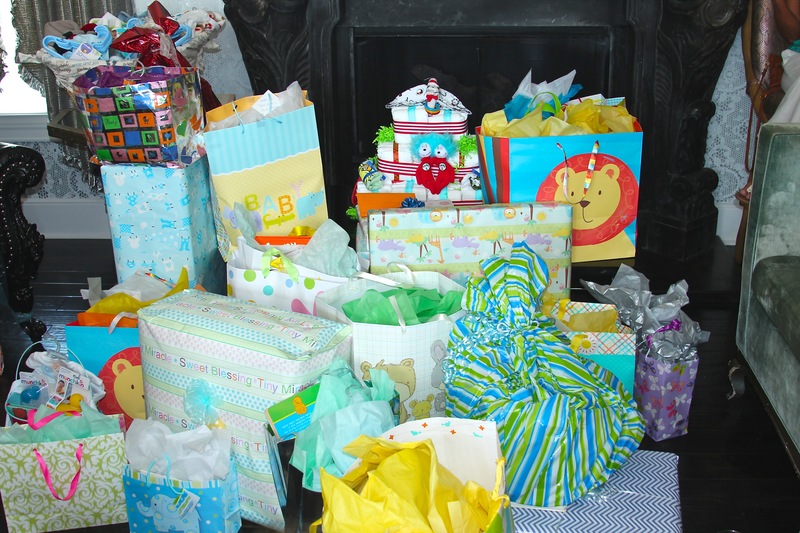 I am still finishing up wrapping my gifts, but as you can see, I have started. 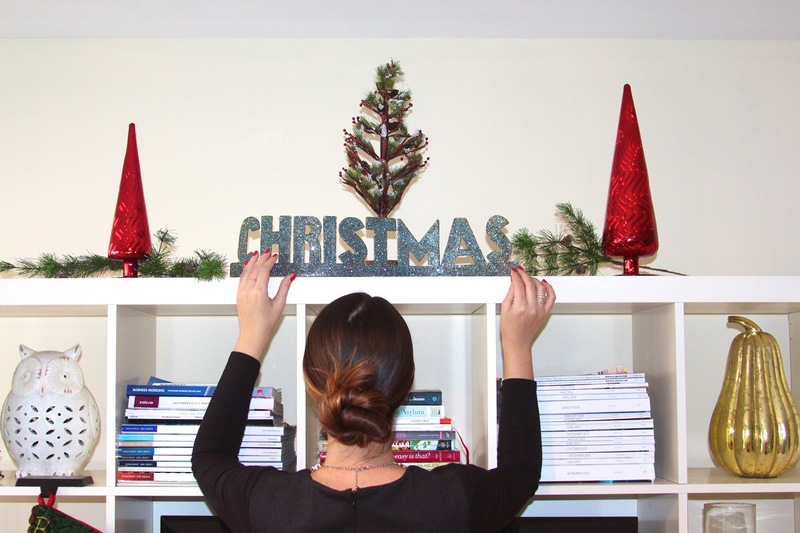 For this post, I wanted to show you how I decorate my apartment and how I would dress up for hosting a holiday party at our place. I opted for this beautiful Lysse wrap dress, which is the perfect elegant LBD. I pinned my hair into a low bun and added some fun diamond jewelry to make the look more festive. Of course I painted my nails this beautiful bright red, because what screams Christmas more than red nails and red lipstick. In terms of decorating, I love my tree to have somewhat of a theme. 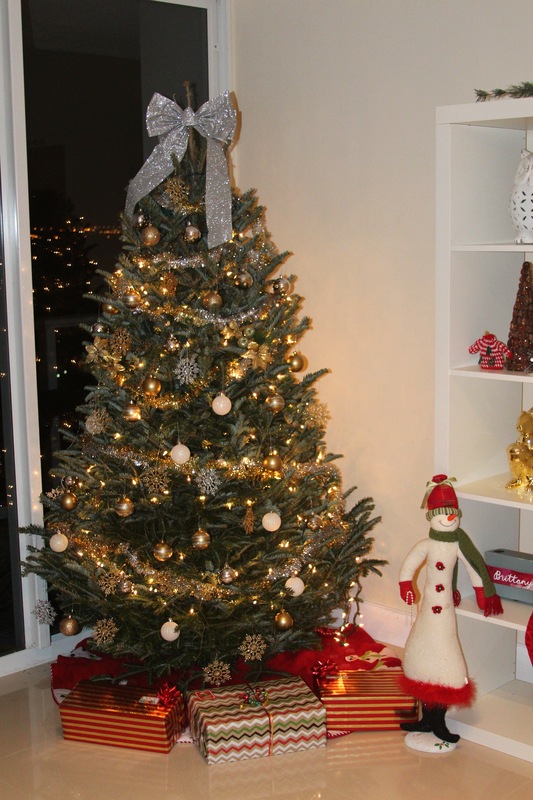 I love having gold and silver decor on my tree and then decorating the rest of the apartment with red and green. I feel that this makes my tree stand out a bit more. To top off my tree, I added an over-sized silver bow to add some pizzazz! And something special about today’s post, I will be also posting my favorite Chocolate Chip Cookie receipe in my “Cuisine” section. 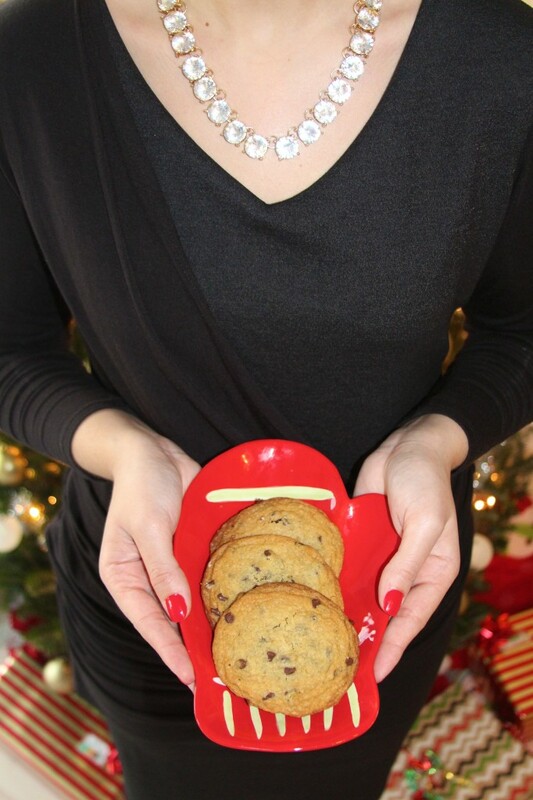 So head over there to get the most delicious cookie receipe for the holiday season!! I hope you all are having a wonderful time prepping for Christmas time! 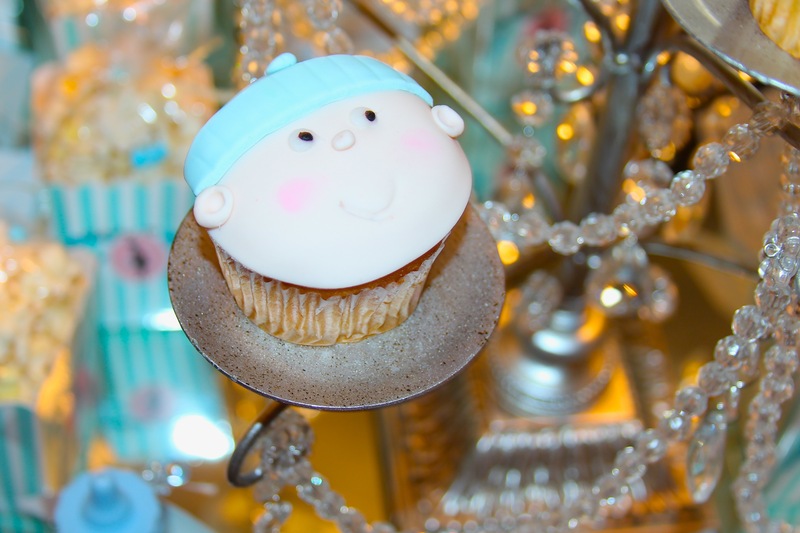 Be sure to come back this week for more fun holiday inspired posts! 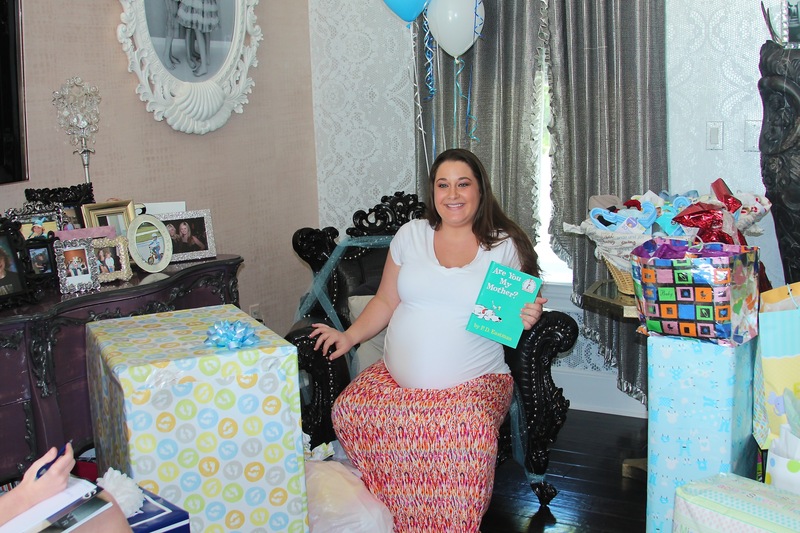 My beautiful cousin Megan is having a baby boy within the next few weeks, so my family and I went up to the Orlando area this past weekend for her baby shower! 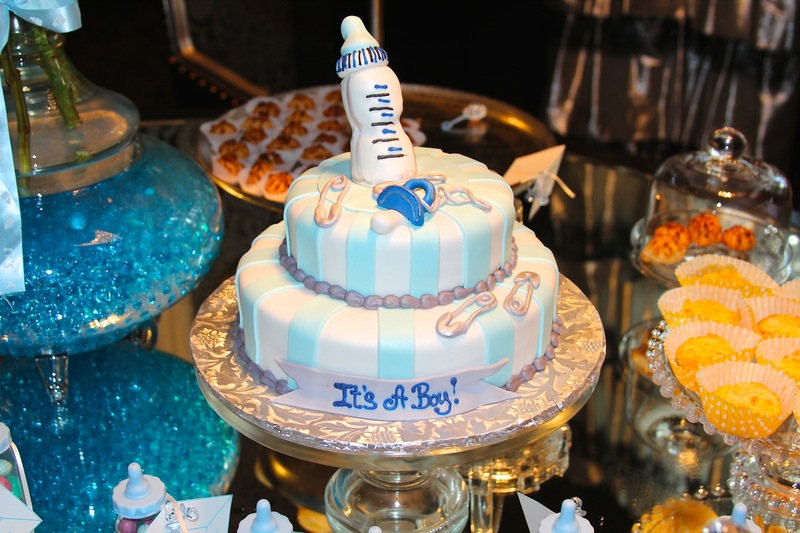 It was a wonderful celebration for the new addition, who is without a doubt going to be showered with tons of love the day he arrives. The decor for her shower was adorable and full of blue touches. 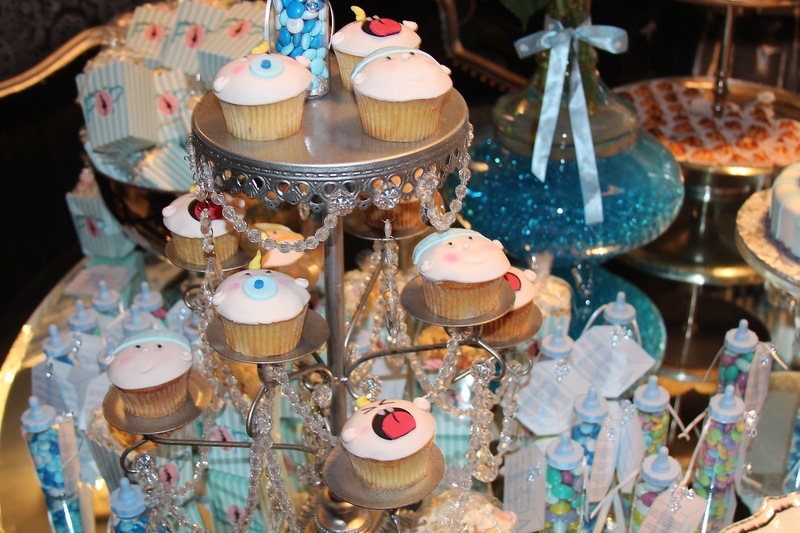 There were so many different types of desserts, party favors, and food with the baby boy theme, and it was all so beautifully done. My favorite gift that Megan received was the set of hanger’s that section the babies’ clothes off by the month that they fit into (see photo 4). 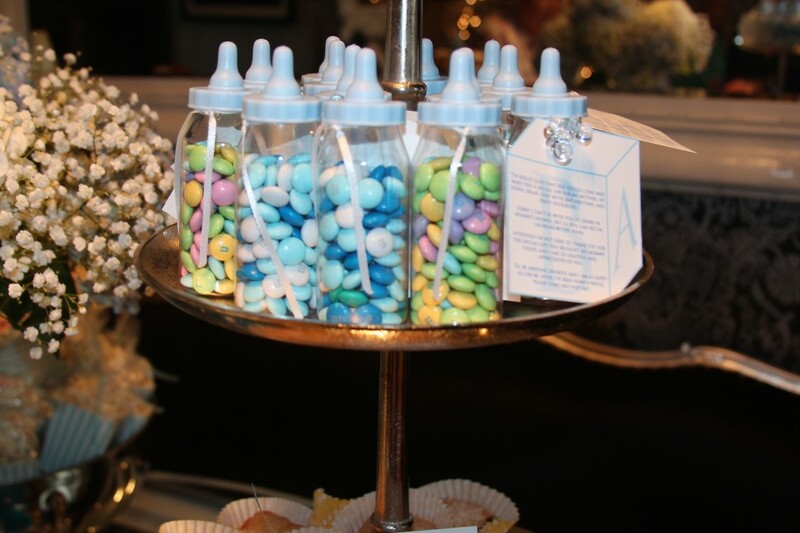 I thought that was a brilliant idea, and it must be so helpful when you receive so much clothing during your baby shower. 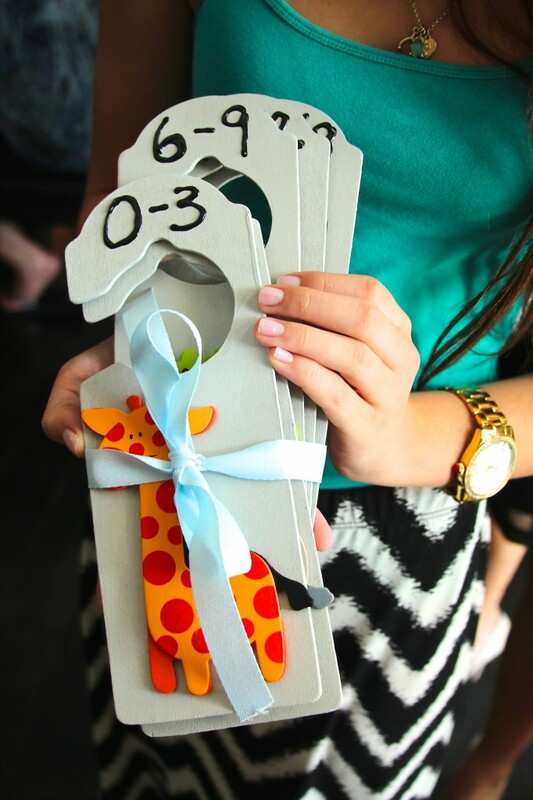 Now, Megan can hang up/pick out the babies’ clothes according to the month’s that he turns. Genius! I loved that idea! My family and I had a great time this past weekend in Orlando. 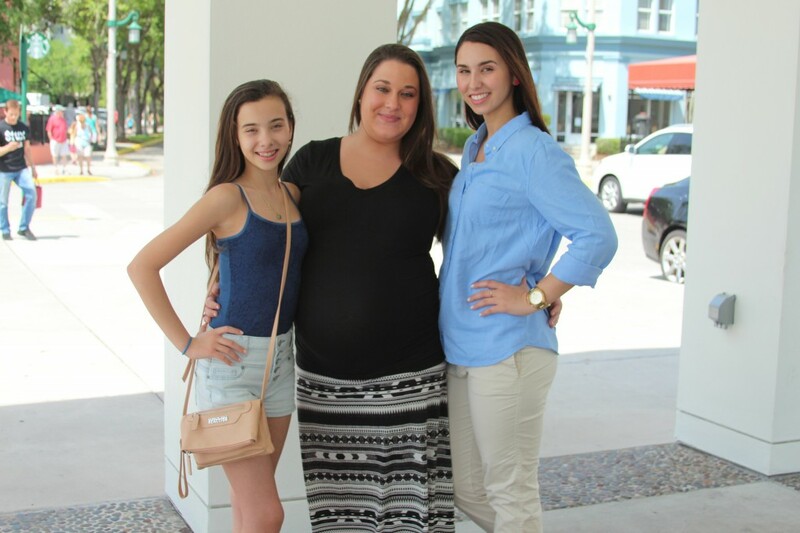 Megan looked great and I know she is going to be the best first time mommy! I cannot wait to meet the new addition to our family! 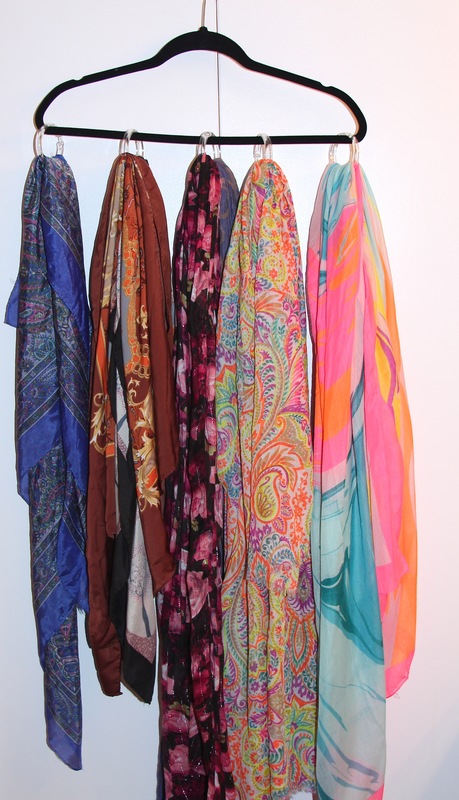 I have been doing a bit of research on how I can better store some of my clothing and accessories and recently came across this great idea that I wanted to share with you all. I have a lot of scarves for all different seasons, and I had them all sloppily placed on a hanger in my closet. So I decided that I needed to find a way to display them better. 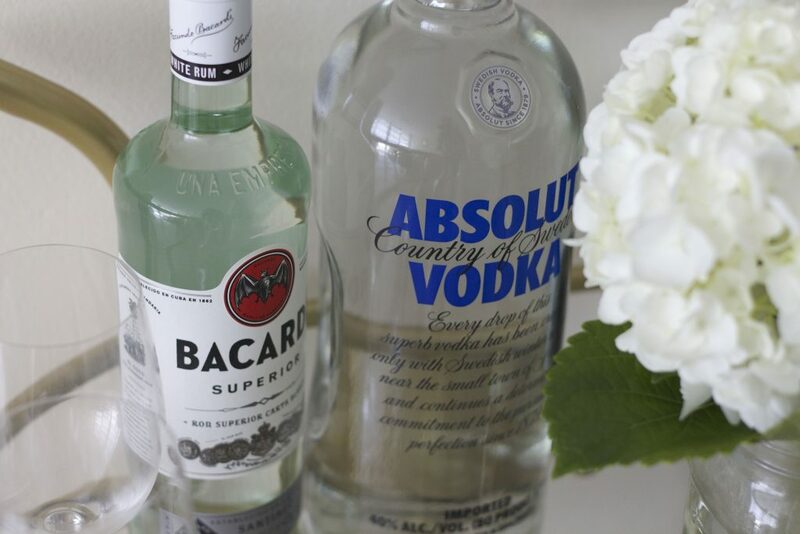 This DIY is very inexpensive, and super easy. 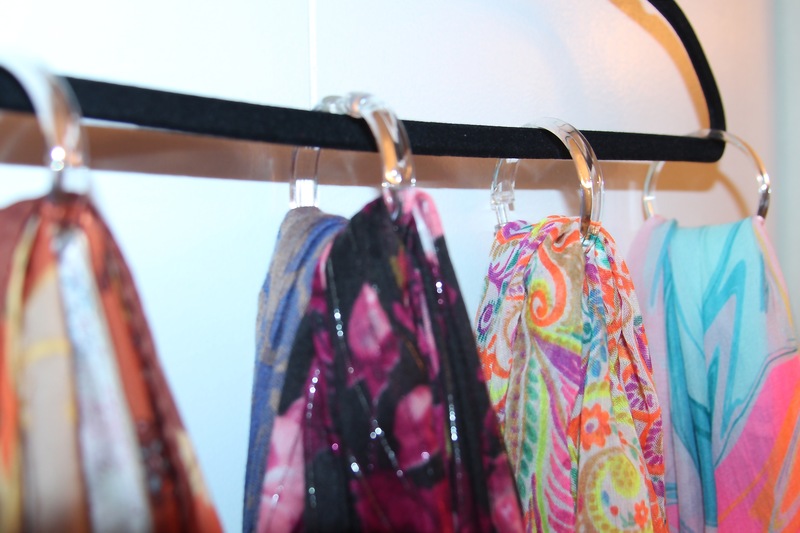 All you need is a hanger, and shower curtain rings. I bought these curtain rings from Walmart for maybe $1.50. The hanger is from Costco (*TIP* all of my hangers are these black felt hangers because having the same hangers makes a closet look clean and more organized). All you do it place the curtain rings onto the hanger, make sure they are secured, and place the scarves through the curtain ring. Simple as that! I hope this helped you in organizing your closet a bit better. 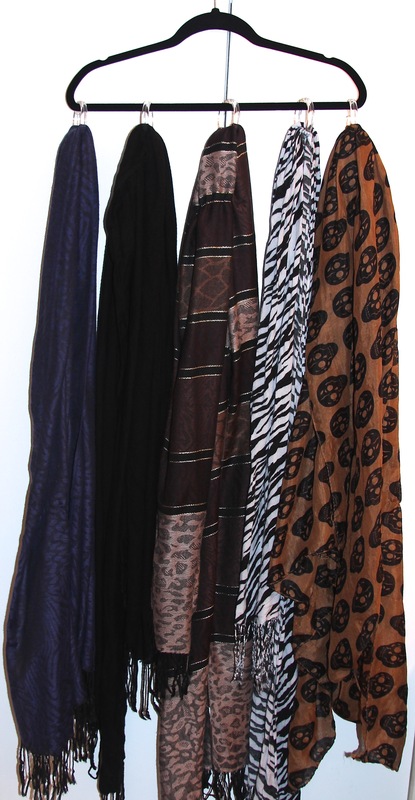 I know I am always looking for easy and inexpensive ideas because I have way too much clothing/shoes/accessories than I have space. I will definitely be featuring more organizational tips as I continue organizing my apartment, so be on the look out for them! This may be one of my favorite DIY projects I have done to date. 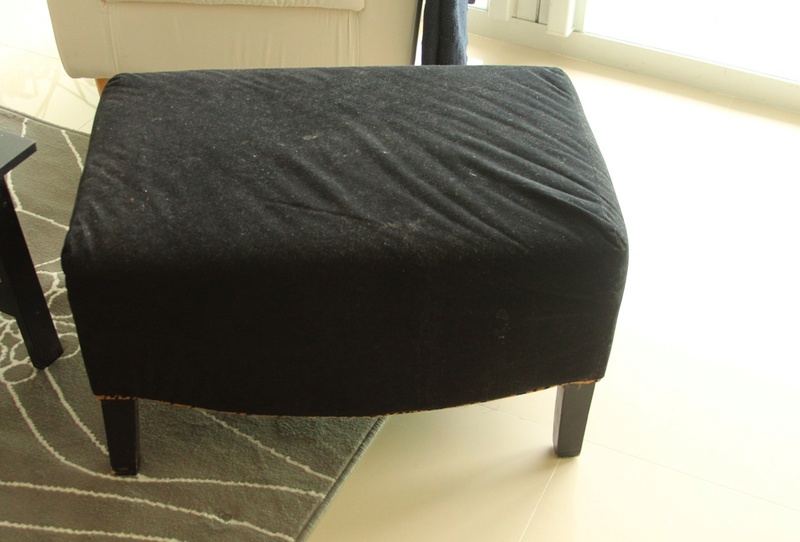 A co-worker gave me this suede-like ottoman that she was giving away, and I thought, this would look so great in my living room if it wasn’t black. 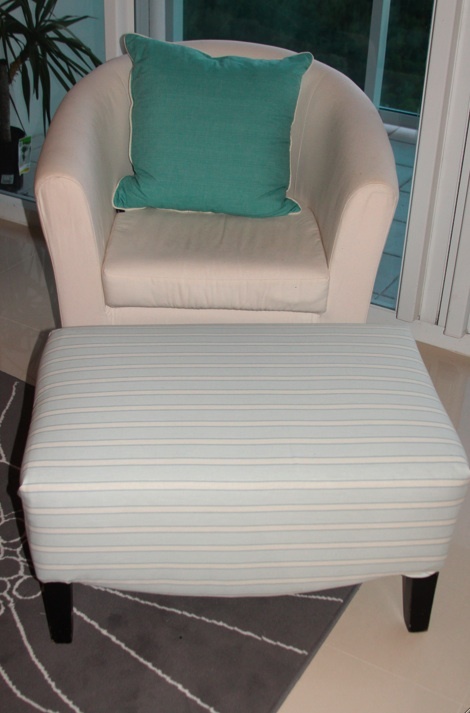 So my boyfriend and I decided to upholster it with material from Walmart. 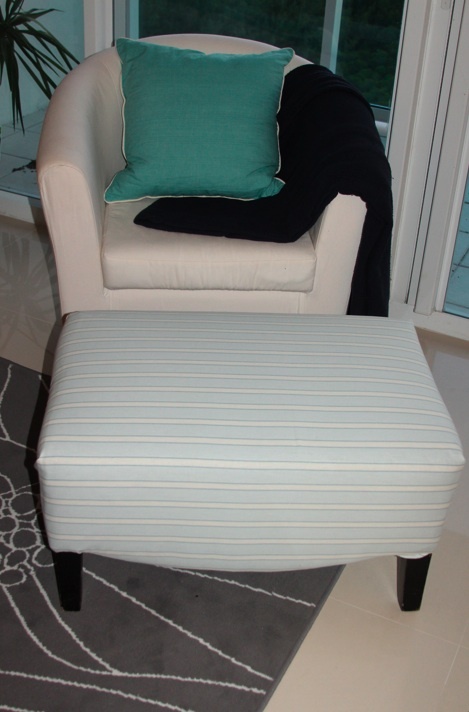 I bought two yards of fabric for $13 and a staple gun. In total, this project’s cost was about $35. Not a bad deal for the outcome. 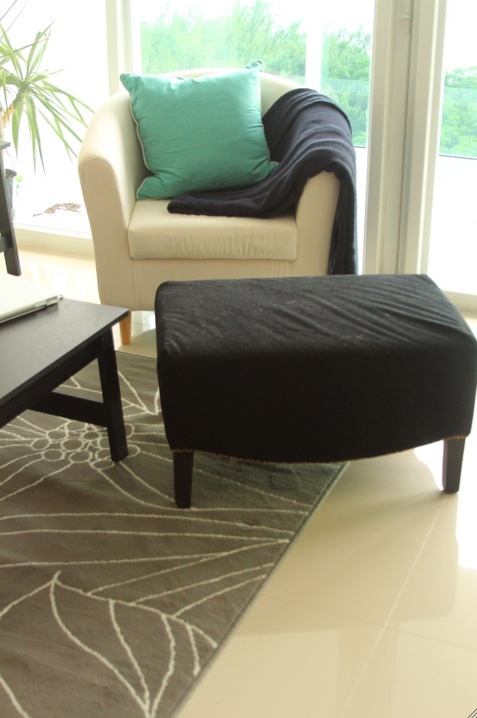 It was a little difficult to finagle with the material on either side where we created the folds, but overall, I think the ottoman looks brand new. If I do say so myself, it looks like I bought it from a store for $100. 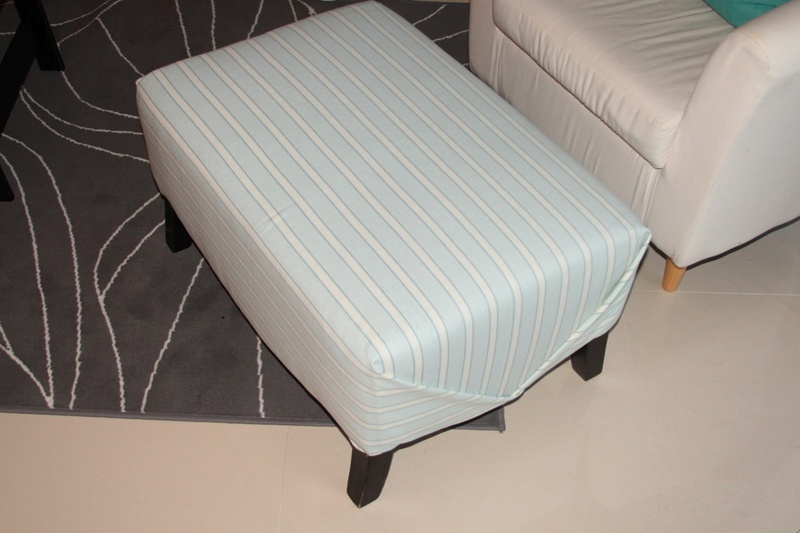 So all it takes is a friend to give you an ottoman for free, $13 worth of material and a good ol’ staple gun. I hope you enjoyed this DIY and thank you for visiting!